“Hohenzollern” redirects here. For other uses, see Hohenzollern (disambiguation). 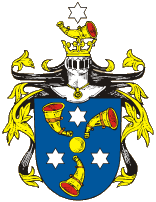 The House of Hohenzollern is a noble family and royal dynasty of electors, kings, and emperors of Brandenburg, Prussia, Germany, and Romania. It originated in the area around the town of Hechingen in Swabia during the 11th century. They took their name from their ancestral home, the Burg Hohenzollern castle near Hechingen. The family split into two branches, the Catholic Swabian branch and the Protestant Franconian branch, known also as the Kirschner line. The Swabian branch ruled the area of Hechingen until the revolution of 1848/49. The Franconian branch was more successful: members of the Franconian branch became Margrave of Brandenburg in 1415 and Duke of Prussia in 1525. Following the union of these two Franconian lines in 1618, the Kingdom of Prussia was created in 1701, eventually leading to the unification of Germany and the creation of the German Empire in 1871, with the Hohenzollerns as hereditary emperors and kings of Prussia. Germany's defeat in World War I led to the German Revolution. The Hohenzollerns were overthrown and the Weimar Republic was established, thus bringing an end to the modern German monarchy. Georg Friedrich, Prince of Prussia, is the current head of the House of Hohenzollern. On 27 August 2011, Georg Friedrich was married to Princess Sophie Johanna Maria of Isenburg. On 20 January 2013, Princess Sophie gave birth to twin sons, Carl Friedrich Franz Alexander and Louis Ferdinand Christian Albrecht, in Bremen. Carl Friedrich, the elder of the two, is the heir apparent. One of the most prominent ruling houses in the history of Europe, the Hohenzollern Dynasty played a major role in the history of Germany from the late Middle Ages until the end of World War I. It takes its name from a castle in Swabia first mentioned as Zolorin or Zolre (the modern Hohenzollern, south of Tübingen, in the Land Baden-Württemberg). The oldest known mention of the Zollern was in 1061 by Berthold of Reichenau. It was a county, ruled by the counts of Zollern, whose descent has been attempted to be linked (without success) to the Burchardinger dynasty. After the death of Conrad II, often referred to as Kurt II who left no male heirs, Frederick III was granted the burgraviate of Nuremberg in 1192 as Burgrave Frederick I of Nuremberg-Zollern. Since then the family name has been Hohenzollern. The cadet Franconian branch of the House of Hohenzollern was founded by Conrad I, Burgrave of Nuremberg (1186-1261). 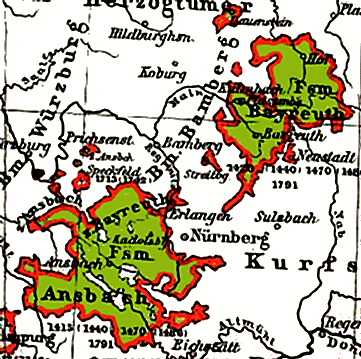 The duchy of Jägerndorf was confiscated by Ferdinand III of the Holy Roman Empire in 1622. The short-lived Margraviate of Brandenburg-Küstrin was set up, against the Hohenzollern house laws on succession, as a secundogeniture fief of the House of Hohenzollern, a typical German institution. From 1688 onwards the Margraves of Brandenburg-Schwedt were a side branch of the House of Hohenzollern. Though recognised as a branch of the main dynasty the Margraviate of Brandenburg-Schwedt never constituted a principality with allodial rights of its own. The Kingdom of Prussia (blue), within the German lands (salmon), as at 1818. The borders of the newly established German Confederation are shown as thick lines. In 1871 the German Empire was proclaimed. With the accession of Wilhelm I to the newly established imperial German throne, the titles of King of Prussia, Duke of Prussia and Elector of Brandenburg were always attached to the title of German Emperor. 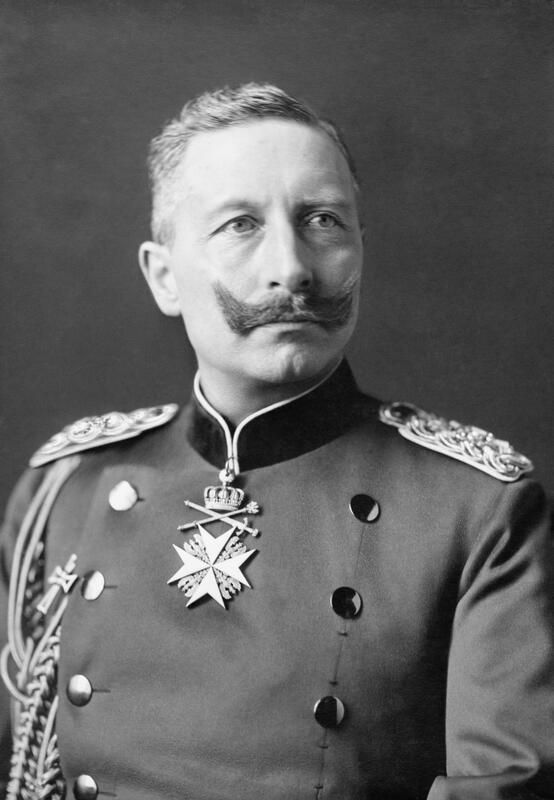 After the outbreak of the German Revolution in 1918, both Emperor Wilhelm II and the Crown Prince Wilhelm signed the document of abdication, with effect only for their own person. Despite the abolition of the German monarchy in 1918, the House of Hohenzollern never relinquished its claims to the thrones of Prussia and the German Empire. These claims are linked by the Constitution of the second German Empire: according to this, whoever was King of Prussia was also German Emperor. However, these claims are not recognised by the Federal Republic of Germany and the German Constitution of 1949 guarantees democracy and republicanism. In June 1926, a referendum on expropriating the formerly ruling princes of Germany without compensation failed and as a consequence, the financial situation of the Hohenzollern family improved considerably. A settlement between the state and the family made Cecilienhof property of the state but granted a right of residence to Crown Prince Wilhelm and his wife Cecilie. The family also kept the ownership of Monbijou Palace in Berlin, Oels Castle in Silesia, Rheinsberg Palace, Schwedt Palace and other property until 1945. The communist government of the Soviet occupation zone depropriated all landowners and industrialists, by which the House of Hohenzollern lost almost all of its fortune, leaving them only with a few company shares and Hohenzollern Castle in West Germany. The Polish government depropriated the Silesian property and the Dutch government seized Huis Doorn, the Emperor's exile seat. After the German reunification however, the family was legally able to claim their movable property back, namely art collections and parts of the interior of their former palaces. Negotiations on a return or compensation for these assets are not yet finished. In 1767 the principality of Hohenzollern-Haigerloch was incorporated into the other two principalities. In 1850, the princes of both Hohenzollern-Hechingen and Hohenzollern-Sigmaringen abdicated their thrones, and their principalities were incorporated as the Prussian province of Hohenzollern. Charles I had only a daughter who died very young, so Leopold's younger son Ferdinand I would succeed his uncle as king of the Romanians in 1914, and his descendants continued to rule in Romania until the end of the monarchy in 1947. In modern times this branch has been represented only by the last king, Michael I of Romania, and his daughters. The descendants of Leopold's oldest son William continue to use the titles of prince or princess of Hohenzollern. King Michael renounced his connection in 2011. Between 1630 and 1681 the county was temporarily integrated into the principality of Hohenzollern-Sigmaringen. After the death of Francis Christopher Anton in 1767, the county of Hohenzollern-Haigenloch was definitively absorbed into the principality of Hohenzollern-Sigmaringen. In 1850 the principality was sold to the Franconian branch of the family and incorporated into the kingdom of Prussia. Nevertheless, the family continued to use the princely title of Fürsten von Hohenzollern-Sigmaringen until 1869 and still use the title of Fürsten von Hohenzollern. The head of the House of Hohenzollern-Sigmaringen, Karl Friedrich, is styled His Serene Highness The Prince of Hohenzollern. His official seat is Sigmaringen Castle. The Principality of Romania was established in 1862, after the Ottoman vassal states of Wallachia and Moldavia had been united in 1859 under Alexandru Ioan Cuza as Prince of Romania in a personal union. He was deposed in 1866 by the Romanian parliament which then invited a German prince of the Hohenzollern-Sigmaringen family, Charles, to become Prince of Romania under the name Prince Carol. In 1881 the Principality of Romania was proclaimed a Kingdom. For dynastic reasons, Carol's grandchildren renounced Catholicism and were brought up in the Romanian Orthodox Church. Michael has retained his claim on the defunct Romanian throne. At present, the claim is not recognised by Romania, a republic. At 10 May 2011, Michael severed all of the dynastic and historical ties between the House of Romania and the House of Hohenzollern. An article on the Coat of arms of Prussia can be found. The explanation of the shield can be found at Great Shield of the Kings of Prussia (German). ^ "A Royal Student Stein". Steincollectors.org. http://www.steincollectors.org/steinmo/2002/Hohenzollern.html. Retrieved 2010-08-28. ^ "Kingdom of Romania". Almanach de Saxe Gotha. http://www.almanachdegotha.org/id32.html. Retrieved 2013-10-03. ^ "Official Website of the House of Hohenzollern: Prinz Georg Friedrich von Preußen". http://www.preussen.de/de/familie/prinz_georg_friedrich_von_preussen.html. ^ Schultze, Johannes; Seigel, Rudolf (1972). "Hohenzollern, Dynastengeschlecht". Neue deutsche Biographie, Bd. : 9, Hess - Hüttig, Berlin. Bayerische Staatsbibliothek. http://daten.digitale-sammlungen.de/bsb00016326/image_512. Retrieved January 30, 2013. ^ a b c Schmid, Ludwig (1862). "Geschichte der Grafen von Zollern-Hohenberg". Geschichte der Grafen von Zollern-Hohenberg. Anhang. Historisch-topographische Zusammenstellung der Grafschaft und Besitzungen des Hauses Zollern-Hohenberg. Google Book: Gebrüder Scheitlin. http://books.google.de/books?id=6ZY4AAAAYAAJ&printsec=frontcover&dq=schmid+zollern&hl=de&sa=X&ei=AdYKUf3TMKSN0QGs24DoCQ&ved=0CDEQ6AEwAA. Retrieved February 1, 2013. ^ a b c Heraldry of the Royal Families of Europe, Jiří Louda & Michael Maclagan, 1981, pp. 178-179. ^ "Romania's former King Michael ends ties with German Hohenzollern dynasty". The Canadian Press. http://www.google.com/hostednews/canadianpress/article/ALeqM5jAy5LQQa0jm53i6f42VFJEduimqQ?docId=6807983. Retrieved 2011-05-11. Marek, Miroslav. "Genealogy of the Hohenzollerns from Genealogy.eu". Genealogy.EU. http://genealogy.euweb.cz/hohz/hohenz1.html. This page uses content from the English language Wikipedia. The original content was at House of Hohenzollern. The list of authors can be seen in the page history. As with this Familypedia wiki, the content of Wikipedia is available under the Creative Commons License.